This highly decorative table consists of a fine quality parquetry inlaid top of stained harewood, satinwood and sycamore with Kingwood banding and gilt metal edge. This leads down to a decorative fine quality marquetry inlaid frieze with a drawer and brass knob handle, within the frieze and at the top of each leg is a moulded panel. 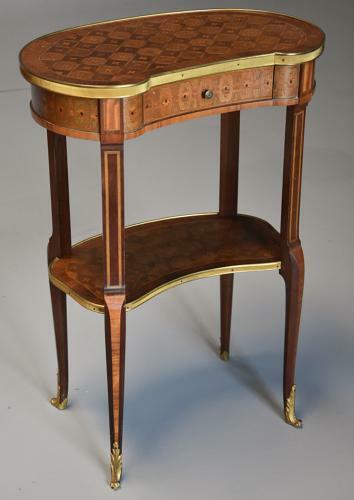 The supports are inlaid and lead down to a kidney shaped parquetry shelf with identical decoration to the table top with Kingwood banding and gilt metal edge terminating with four cabriole legs and ormolu sabots to the feet.